Home » Featurewatch » Moosend introduces new campaign editior features. Moosend introduces new campaign editior features. Α new set of features has just been released into the Moosend newsletter editor, Now users can drag and drop images, crop and resize them, align pictures, add HTML components, edit fonts, set background images, preview the mobile, tablet or desktop version. If marketers want their newsletter layout to remain as it is, even on responsive devices. Now they can choose a new property in the “Row Menu” called “Responsiveness”. Locking the row in place instead of displaying it as a 100% width responsive manner. The image below shows the difference between responsive and non-responsive rows (responsive top row and non-responsive bottom row). Marketers who like to look under the hood can view the code they are creating with the editor. The newsletter design area has 3 views: the design view, code view and split view. The design view allows for dragging and dropping content and creating a newsletter through the editor’s interface. 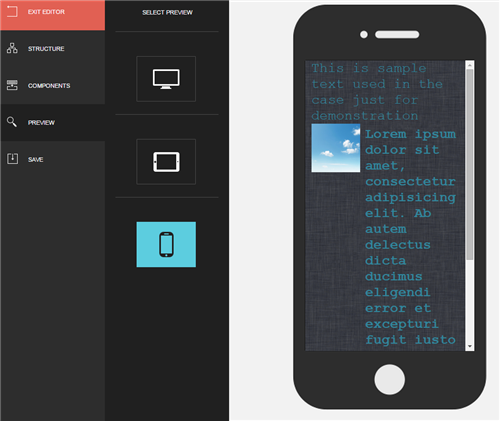 The code view fills your screen with the HTML code being generated from the editor while you design. The split view allows you to see both the design and the code at the same time. Any changes you make on the design pane are directly shown in the HTML code pane. With the 1.1 release of the Moosend editor, users the ability to drag and drop image files from their PC directly onto image components, articles, described images or empty slots. If you drag an image over a component that can accept image upload, its border and the image placeholder will become green. Users can resize an image by dragging its lower right cornerImages are automatically resized the image to the slot’s maximum width every time you relocate the component. A user can horizontally align images to the left, center or right using the property highlighted in the figure below. Images can now also be cropped before they are included in a newsletter. The original image is also stored. The cropping window is shown every time an image is uploaded. Users can now embed their own HTML code within the newsletter. The integrated HTML editor has syntax highlighting and closes your tags automatically once you’ve entered the ‘>’ symbol to complete a valid HTML tag. Marketers can now add a background image to their newsletters. The top section of the newsletter settings called “Background Properties” in Moosend is used to change the background color and the background image of the newsletter. Users can now preview newsletters as shown on a tablet or a mobile that is capable of rendering responsive newsletters. From the editor a marketer can switch between devices onto which your newsletter is previewed as shown below.